When I launched my pet photography studio in 2005, there were only a small handful of pet photographers worldwide, including the likes of Amanda Jones and Jim Dratfield. But, if you googled ‘pet photography’ back then, there was only one name at the top of page one: Cowbelly Pet Photography. Cowbelly (cowbelly.com) was founded by my colleague and friend, pet photographer extraordinaire Jamie Piper (formerly Pflughoeft). Jamie was the original pet photography expert. She was the first to bring pet photography workshops to the market, and was a constant mentor and leader, pushing the pet photography industry forward, and generously sharing her knowledge and experiences. Along the way, she built a brand called ‘Beautiful Beasties’ – a hub of learning and connection for aspiring pet photographers. There was a forum, an educational blog, and the Beautiful Beasties book, a 350-page pet photography ‘bible’ – a must-read for anyone photographing pets casually or professionally. Jamie has since retired from teaching and mentoring, and now shoots exclusively commercial work. In 2016 Animalhaus acquired the Beautiful Beasties network and brand, so that the wonderful resources she created and curated can live on. 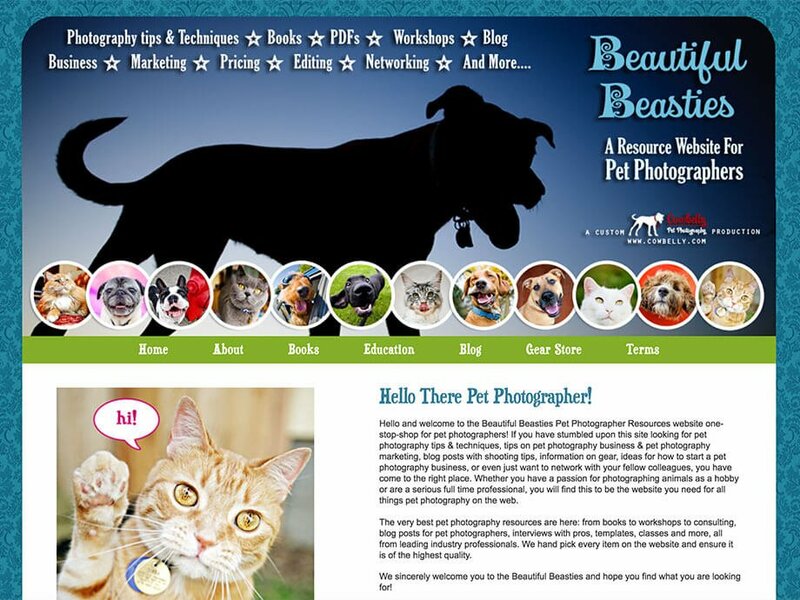 We will soon be releasing the entire contents of the former Beautiful Beasties forum in an ebook an a-to-z compendium of real photographers sharing their questions and answers, tools, tips, techniques for starting and running a profitable pet photography business. Sign-up below to get notified when this epic pet photography resource is available!